Whether you’re looking to distract your new pup with some rawhide chews or have particularly aggressive chewer who loves to grind down on those rawhide bones, it’s no secret that these chews are the most satisfying treats you can give to a dog who loves to chew. Yet, with so much contradictory information out there, it’s hard to know whether or not you’re doing the right thing by giving your dog a rawhide chew. We’re here to put those rumors to rest, give you the complete and up-to-date facts on whether rawhide is good for dogs and have even been kind enough to give you our top picks in the best rawhide chews on the web. So, lay your concerns to rest and read on for the best information about rawhide you’ll find anywhere on the web. Designed to work with Busy Buddy’s pet toys but equally as enjoyable on their own, the Gnawhide Refills from Busy Buddy are natural rawhide rings that allow for safe and simple chewing from your dog. Rigorously tested to produce the highest standard of quality rawhide for your dog, PetSafe have worked hard to give the best quality ingredients and manufacturing process to you and your pup. 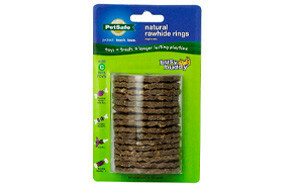 When used in tandem with the Busy Buddy pet toys, these rawhide rings are a great way to stimulate your dog both mentally and physically, helping with separation and anxiety and ensuring your dog is able to safely chew away on these delicious rawhide treats. Used alone, they are still loved by dogs and owners alike. Reviewers mention the high quality of these rawhide chews, which is backed up by the multitude of testing used to ensure the best quality rawhide for your pet. And, with over 1,500 positive reviews from customers, you can be sure that your dog will love these treats as much as the previous customers have! Made with no fillers or artificial binders, these mini rawhide “bones” come with an added layer of real chicken to really entice your dog into having a good chew! 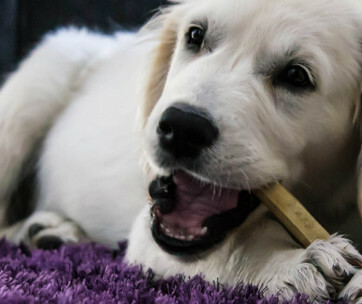 Ideal for puppies and small dogs, these mini chews are made to the highest standard, allowing you to rest easy knowing your dog is happily chewing away on high-quality rawhide. While not a great option for larger dogs, thanks to their small size, these still make it as our second option thanks to quality of ingredients used and the simple manufacturing process that creates these little bones of delight. Packed with flavor, these are a particularly good option for puppies who are being introduced to the world of rawhide- especially as the added chicken really amps up the scent, which can easily entice any keen-nosed doggy into its spell. A better option for larger dogs, or those who are aggressive chewers, these triple-flavored rawhide bones are a great option for those pups who really love a good chew. Using both pork and beef hide as part of the main make-up of these chews, each bone is also wrapped with premium chicken breast. 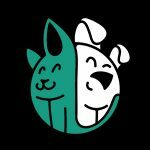 Good’n’Fun are also incredibly proud of their production facilities, which has earned them the accolade of being one of the highest US and internationally-approved and certified manufacturers of dog food and treats. They have some of the highest-rated dog treats across their online accounts and the reviews from dog owners speak highly of their rawhide bones, many of which mention that their dogs are in love with their new treats. These chicken hide twists are slightly smaller and thinner than others in our top picks but are still a great option for smaller dogs and puppies- or to give as a short-term chew for your larger dog. With no preservatives, additives or artificial colors, and being free of soy, corn and wheat, these are a fantastic choice for those whose dogs have sensitive stomachs. These are natural rawhide sticks that are covered in 100% chicken breast, which makes them perfect for enticing new noses into chewing the right stuff. They are made in China but are met with rigorous testing to ensure that all ingredients match the highest standards available in the US. 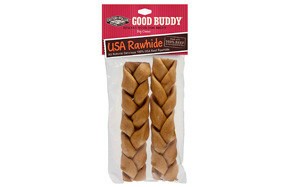 Made with 100% US beef, these braided rawhide chews are ideal for aggressive chewers and larger dogs. Thanks to lack of added ingredients and chemicals, these may be a little softer than others on our list, but the high-quality beef and home-made rawhide chews are still an amazing option for those who want the added security of knowing that their dog’s chews are made in the US. Many customers mention that their pets who had previously had issues with other chews had no such problems with these braids, which is further testament to the lack of fillers and chemical productions added to the manufacturing process. Having previously gone through some issues with their quality control, these Retriever Rolls are back to the high quality we had all previously known and fallen in love with. These are one of the best rolled rawhide chew options online, today and are made with high-quality, rolled rawhide that is ideal for any and all dogs. The hide here comes from Brazil and Paraguay, which usually make for slightly thinner hides and can therefore be broken down a little easier. That said, these are still tested and inspected in the US and so hold the same safety and quality as US cattle- the main difference is simply the thickness of your dog’s new treat. Another rawhide chew made from Brazilian cattle, this braided rawhide ring is surprisingly tough and perfect for those with large dogs, or those whose dogs are aggressive chewers. Made from 100% beef hide and free from additives and preservatives, this is a fantastic option for a healthy chew designed to keep your dog happier, for longer. Customers love the longevity of these braided rings and are especially taken with the lack of bleaches and chemicals used during production. That said, the main drawback for these rawhide chews is that they do take a while to arrive, so if you’re looking for something to be delivered as soon as possible, these may not be the best choice for you. Possibly one of the most natural products on our list- bar our top pick- these rawhide sticks are made of 100% beef rawhide, which is sourced from free-range cattle and created with no additives, preservatives or flavorings. They are also gluten and grain-free, which makes them perfect for sensitive stomachs. The fact that these rawhide sticks are made from compressed rawhide also means that they are much more likely to have an increased longevity, which makes them ideal for dogs with strong jaws or aggressive chewers. They’re also easily digested, which allows for greater peace-of-mind in buyers, many of whom note that their dogs are in love with these rawhide treats. 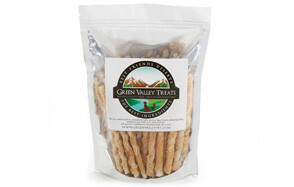 Another option that is the product of Brazil, these thinner rawhide chews are great for short-term chews for dogs. Their thin nature allows to easier digestion, but you’ll need to be aware of possible brittle flakes, which are unlikely but can still cause some damage. While not the best choice for larger dogs, who are more likely to try to down them in one go, they are a great size for toy breeds or puppies, who are more likely to take their time and enjoy these little chews. Sourced and made in the USA, these rawhide sticks are wrapped in chicken jerky for added flavor and to seriously entice your dog into have a good chew. These little sticks of goodness are made to order and therefore take a few days to arrive- but the lack of shelf-time also ensures that you receive a much fresher, higher-quality rawhide chew that your dog will love. Being one of the rarer options of having both the meat and production line based in America, these are possibly the freshest choice on our list, although their small nature makes them the better option for small dogs and puppies only, we’re afraid. 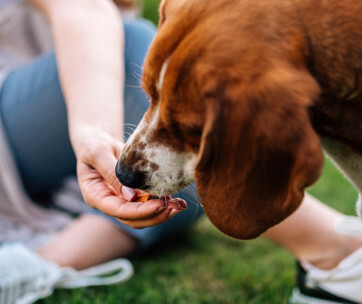 Rawhide dog treats that are fresh are much less likely to have undergone multiple chemical processes, in order to get the right consistency, taste and overall quality. Rawhide that has come from abroad is more likely to have been through multiple processes, which usually include the use of hydrogen peroxide. They could even be coated with titanium oxide, to make them appear more appealing on the shelves of your local pet food store. As you can see, there’s a huge benefit to buying home-grown rawhide, that is both produced and manufactured in the US. Not only does this improve the freshness of the product, but it also means that there are more stringent quality controls that manufacturers are legally bound to follow. This means you’re less likely to find harmful chemicals used in the production line, which equates to a much healthier chew for your dog. The thickness of your rawhide has an effect on how long it takes for your dog to work their way through their latest treat. The overall thickness doesn’t necessarily indicate any issues with the quality of the rawhide sticks, but you should be aware that American cattle tend to produce thicker, evenly grown hides, so they can be a sign of the country of origin. Odor can be a difficult one to get right- especially since we don’t have the same, keen senses as our dogs. The most important thing to remember is that you don’t want rawhide that smells too much- as this can be a sign of decay and a high number of bacteria being present. Similarly, a good rawhide chew won’t be completely scent-free, as this can indicate over-processing of the materials. The odor can be particularly important for puppies- as they are less likely to first understand what the chew actually is, at first and will happily continue having a munch on your furniture. Rawhide for puppies should have a slightly stronger smell, as it will encourage their natural instinct to chew. A white rawhide is likely to have been heavily bleached and can therefore be considered an unnatural color. As rawhide is naturally a lightly tanned color, you can be sure that these treats are much less likely to have gone through an extensive bleaching process and are, therefore, much healthier rawhide dog treats than their lighter counterparts. Dogs and puppies- especially puppies- love to chew. It helps to keep their jaws strong and their teeth clean. It’s also part of their natural instinct to want to chew pretty much everything in sight, so having a good quality rawhide chew available to distract then from your table legs and shoes can be a huge benefit. This gives them to ability to scratch the itch of desperately needing to take everything apart, without your furniture suffering the consequences. Dogs who suffer from separation anxiety will pace, bark and chew everything. If you’ve ever come home to find your home littered with general debris as a result of your dog going to town in your absence, don’t be angry. Understand that your dog chews as a way of dealing with the anxiety of being away from you. They are, after all, pack animals and are driven to be by your side at all times. Rawhide dog chews are a great way of giving them something to focus on, if you’re away for a while. This will allow them to get out that frustration and anxiety, in a natural way, without damaging your furniture or goods. Puppies who are teething will likely chew even more than an older dog would- which, considering what we know about how much dogs love to chew, is a lot. Having the ability to chew allows your pup to relieve the pain of teething, and also helps encourage their adult teeth to grow. Puppies are renown for chewing anything and everything they can get their mouth around. Having a rawhide chew available can distract them from those tasty-looking table legs and encourage them to chew only these specific treats. After all, the best to stop your dog from doing something naughty is to distract them from the behavior your disapprove of. The majority of properly sourced rawhide is completely safe for dogs, but you should still be aware of some of the risks that come with giving your dog rawhide. If properly counteracted, you shouldn’t have any issues with these dangers, however and we discuss the best safety measures in more detail, below. In the same manner as general dog food and toys, rawhide dog chews can eventually develop Salmonella and E.Coli. In order to avoid these, you should ensure that your dog never takes their rawhide chew outside and should throw your rawhide away if you notice that is has been left for a long period of time, or becomes dirty. You should also be sure to wash your own hands, once you’ve thrown away your dog chew or after handling the rawhide, to ensure there is no cross-contamination, as humans can suffer from these bacteria, too. Some dogs may simply be a little sensitive to either the hide itself or the chemicals used in the manufacturing of rawhide. Symptoms of this usually include sickness and diarrhea and, if you spot these signs, you should stop giving your dog rawhide immediately. It is also advised that you take them to the vet, to see if there are any further issues along the digestive tract. Rawhide that is poorly made can be brittle, and flake into many pieces, which can become trapped in the esophagi, causing your dog to choke. It can also create blockages, deeper in the digestive tract. If you notice any strange behavior from your dog, such as gagging or a refusal to eat, take your pup to the vet immediately, as these can be signs of choking or blockages. 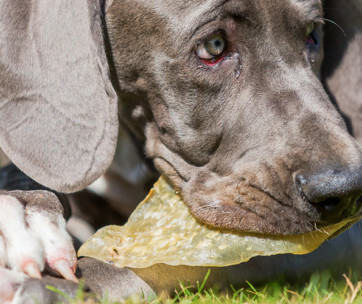 We discuss some of the best ways to minimize risks to your dog, further in our FAQ section, but the main thing is to always keep an eye on your dog when they’re using a rawhide chew. In particular, stay by your pup if this is his or her first time with a rawhide chew, as you will be able to gauge their reaction and step in as soon as possible, if something is wrong. Arguably the best rawhide for dogs, rolled or cut rawhide chews are created using whole pieces of rawhide which are simply rolled into a cylindrical shape. You can usually tell if they are rolled rawhide by looking at the ends, as you’ll see a spiral shape from the rolling process. These tend to be a little thicker and less likely to break up than other rawhide types, so are the preferred type for many dog owners. Many companies may try to pass their chews as rolled, but are actually filled with sharper, broken pieces that have been placed together, which are more likely to cause problems for your dog. You can usually tell the difference between the two, when looking at the ends of the roll, since the inner layer of the rawhide will look as though it has been squashed together. Granulated rawhide can be seen as being better for puppies but require a lot more supervision. They are flakier and tend to break apart a lot easier than other varieties of rawhide, but this can come with its own set of issues, such as a higher risk of choking or internal damage. As such, you should be sure that this option is created from softer ingredients, which will lessen these risks. Compressed rawhide is created by using multiple sheets of thin rawhide, which is then “glued” together during the production process. These are the least desirable types of rawhide for a few reasons; the first is that the hide itself is likely to come from abroad, as American hide is known to be thicker and therefore require less “compression”, which comes with its own risk, as we discuss in more detail below. The second issue is that these rawhide chews are usually bound together using collagen, although there is no surefire way of determining this, since collagen isn’t considered a food item and therefore cannot be listed on the ingredients section of the label. The benefit to compressed rawhide is that it usually tougher, which is ideal for aggressive chewers and dogs who have very strong jaws. The rawhide is much harder to get through and therefore will last much longer than other types. Q: What are rawhide dog treats made of? A: All rawhide items are actually a by-product of the leather industry. Essentially, the production process takes the hide from cattle- usually American, thanks to its thicker properties- and then uses a series of separation techniques to gain multiple items. The first being leather, which is then used to make shoes and fashion products, and the second, which creates rawhide. Since there are very few tanneries in America, which is where the process needs to be undertaken, the majority of rawhide dog bones actually come from China. Of course, this requires extensive travel and usually involves methods of maintaining the hide during its trip, which can alter the overall quality of the rawhide. So, getting rawhide for dogs from the US is usually a sign of good quality. Q: Are rawhide dog bones safe for my dog? Always wash your hands both before and after giving your dog their chew- even new ones. This can help cut the risk of contamination significantly and allows you to more accurately predict the source of any issues, should any illnesses occur. If you have multiple pets, allow your dog to have a little space as they chew. This is because many dogs will eagerly wolf down their food as a faster rate, if they are concerned that another pet may swoop in and steal their food. As you can imagine, their added haste can create problems, such as choking or blockages, as the food won’t be fully broken down before being swallowed. Keep an eye on your dog when they’re enjoying their rawhide. Being nearby when your dog is enjoying their chew will allow you to step in straight away should anything go wrong, or you notice problems. It will also mean that you are more likely to notice possible issues before they occur and take the chew away before it becomes a problem. Speaking of being proactively protective of your pet. Be sure to take the chew away when you notice it becomes small enough for them to easily place the item in the mouth, whole. You should also keep an eye on any flakes or brittle pieces that come away from the rawhide chew for dogs and be able to clean them up, so as to avoid any internal damage to your pup. If you’re not sure how much rawhide your dog should be given, or if you’ve had an issue with a previous piece of rawhide, be sure to consult your vet. They will be able to conduct a more thorough investigation and see if there are any allergies at play, or will simply give you advice as to how much rawhide your dog should chew, without it becoming a health hazard. Q: Does my dog need supervision while chewing rawhide? A: Dogs are very much like infants, in that they like to put everything in their mouths and can usually be a bit of a risk to themselves if left alone for too long. As such, you should always be aware of what your pup is doing and be prepared to jump into action when you’re needed. In other words, you should always remain present but allow them to have some space. The Busy Buddy Gnawhide Refills easily comes at the top of our list thanks to PetSafe’s sheer dedication to providing top quality rawhide chews for dogs. These disc-shaped chews are made with natural rawhide that hasn’t been over-processed, yet still come at a great price and are loved by dogs and owners alike. Use with one of the specially-designed chew toys to expand your dog’s playtime and stimulation, without worrying about the over-saturation of chemicals or likelihood of brittle and poor-quality rawhide. Loved by thousands, these refills work brilliantly to keep your dog entertained, and the thorough testing means you can rest easy, safe in the knowledge that you dog is happy and healthy with their rawhide chew.